A high-quality gas grill shouldn’t be just a thing of beauty that strikes up the occasional conversation at the family cookout. It should also be a cooking companion with the versatility to conveniently prepare a wide range of dishes. The Broil King 956214 Regal 420 ticks off all these boxes, and has the quality to last. The lid and cook box body of the 420 Regal is made from high-quality stainless steel and cast aluminum. The knobs even have an illumination feature that comes on after the sun goes down. The cabinet base itself is fully enclosed to house the propane tank and any other gadgets, without fear that a little rainwater will infiltrate. The Broil King Regal 420 has four independently controlled propane burners that use linear flow burner valves. Each element has 120 ports to release an efficient heat. At full roar, this means it is capable of producing up to 50,000 BTUs. There are also Flav-R-Wave plates under the grill grates which quickly vaporizes most drippings for added smoky flavor. The grill grates are made from porcelain coated cast iron and sculpted to have two different shapes. On one side the grates are pointed, to create appealing grill lines. The other side of the grates are curved to hold more of the natural juices close to the meat and replicate continuous basting. Broil King also sells stainless steel grill grates that are made from heavy-duty rods for maximum heat retention. 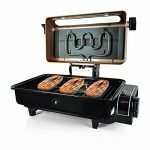 The Broil King Regal 420 also includes a basic rotisserie, which allows you to slow cook a broiler-fryer chicken or a few Cornish game hens. There is also a side burner hidden inside one of the side tables. It allows you to prepare some basic side dishes without having to run back and forth between the grill and the kitchen. Broil King understands that quality matters when you are going to invest in a high quality grill. So, they made sure to step up to the plate and offer durable materials. They further back up their commitment by offering a limited lifetime warranty. When it comes to assembly, you are going to have to accept that this is a pretty complicated grill. You are going to kill an entire weekend afternoon assembling this bad boy. The disguised flip top side burner is particularly fiddley, so keep your patience while you put it together. If you have a friend with an engineering degree or the patience of a Buddhist monk, you might want to ask them over with the promise of a well-cooked meal afterward! One tiny knock on the Broil King Regal 420 is that at this time, there is no natural gas conversion kit available. However, there have been rumors of one in the works in the future. You can certainly cook a lot of different dishes with the Broil King Regal 420. You just have to be mindful of how you set it up for what you want to grill. For example, the dual-sided grill grates. If you are going to make a steak or some hamburger patties, then you want to set up the grates on the pointed side. This will make nice grill marks while allowing the rendered fat to drip away onto the Flav-R-Wave plates. If you were to have the grates on the contoured side the fat will collect for a while until it overflows, making a potentially major flareup! The rotisserie is a nice added feature. A lot of other grills that have the ability to use a rotisserie offer it as an accessory that you have to buy on the side. The fact that the Broil King Regal 420 comes with it as part of the stock package is something you shouldn’t scoff at. The Sure-Lite electric ignition is nice, but really is something that should come standard for any gas grill in this niche. The small propane burner hidden in the side table is nice, but it’s something you would sort of expect with a grill of this caliber. The side table itself is maybe a little too small for something like a large frying pan or a 1-gallon pot of water. The Broil King Regal 420 offers 550 square inches of grilling space in the primary grates. It also has a large warming rack for holding over food that gets done early. The Flav-R-Wave plates help vaporize dripping for added aroma and flavor. The Sure-Lite igniter helps you to conveniently fire up the four burner elements and the flip top side burner. If you get the dual contour grill grates are a nice touch for marking or grease management. The Flav-R-Wave plates help minimize the amount of drippings you have to clean up. There is also a grease collection trap that’s easy to remove. Beyond that, you just need to scrape down the grill grates. If you get the stainless steel grates, you might want to use a stiff-bristled nylon grill brush to instead of metal. This will minimize any unsightly scrapes. Broil King states that they have a limited lifetime warranty on the Regal 420. When you look at the fine print, you’ll find that the lifetime warranty is only on the cast aluminum parts. There is a 10-year warranty on Dual-Tube burner system, and 2 years on all remaining parts and paint. 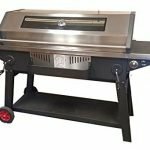 While it might not be a true lifetime warranty on the whole grill, the warranty that they do offer is in the league or even a step and a half above many of their competitors. Broil King isn’t necessarily one of the “Big Name” brands. Still, they are coming along and putting their best food forward to provide their customers with a quality grill intended to last a long time. The fact that you get some other little innovations that come as part of the standard package is a nice touch, and it is a testament to the fact that they are trying to develop customer loyalty.